Seismic Theophany is a literary motif where earthquakes are seen as a manifestation of God’s will. Examples in Hebrew (primarily prophetic) literature follow. While modern scholarship views the Book of Isaiah as being written by more than one person, the section above is from a part of Isiah which is thought to contain his words and to have therefore been composed a decade or two after Amos. Zechariah references the Amos earthquake (the earthquake in the days of Uzziah king of Judah) at the end of the quote above and also mentions seismic effects (splitting of the Mount of Olives) that do not (to me) seem to be geologically plausible. However, the “splitting” of the Mount of Olives may be a “fanciful” description of seismic effects recounted in now lost oral and written descriptions of the original Amos Quake. At the end of the first century AD, Josephus wrote the following paragraph in his book Jewish Antiquities about Uzziah – the King of Judah when the Amos quake struck. 4. While Uzziah was in this state, and making preparation [for futurity], he was corrupted in his mind by pride, and became insolent, and this on account of that abundance which he had of things that will soon perish, and despised that power which is of eternal duration (which consisted in piety towards God, and in the observation of the laws); so he fell by occasion of the good success of his affairs, and was carried headlong into those sins of his father, which the splendor of that prosperity he enjoyed, and the glorious actions he had done, led him into, while he was not able to govern himself well about them. Accordingly, when a remarkable day was come, and a general festival was to be celebrated, he put on the holy garment, and went into the temple to offer incense to God upon the golden altar, which he was prohibited to do by Azariah the high priest, who had fourscore priests with him, and who told him that it was not lawful for him to offer sacrifice, and that “none besides the posterity of Aaron were permitted so to do.” And when they cried out that he must go out of the temple, and not transgress against God, he was wroth at them, and threatened to kill them, unless they would hold their peace. In the mean time a great earthquake shook the ground (21) and a rent was made in the temple, and the bright rays of the sun shone through it, and fell upon the king’s face, insomuch that the leprosy seized upon him immediately. And before the city, at a place called Eroge, half the mountain broke off from the rest on the west, and rolled itself four furlongs, and stood still at the east mountain, till the roads, as well as the king’s gardens, were spoiled by the obstruction. Now, as soon as the priests saw that the king’s face was infected with the leprosy, they told him of the calamity he was under, and commanded that he should go out of the city as a polluted person. Hereupon he was so confounded at the sad distemper, and sensible that he was not at liberty to contradict, that he did as he was commanded, and underwent this miserable and terrible punishment for an intention beyond what befitted a man to have, and for that impiety against God which was implied therein. So he abode out of the city for some time, and lived a private life, while his son Jotham took the government; after which he died with grief and anxiety at what had happened to him, when he had lived sixty-eight years, and reigned of them fifty-two; and was buried by himself in his own gardens. The original seismic effect from the Amos Quake may have been a landslide on the Mount of Olives and damage to the First Temple in Jerusalem which in some ensuing oral traditions “grew” into a crack (rent) that split out from the Temple and included “splitting” of the Mount of Olives; thus inspiring parts of Zechariah’s prophecy. Wachs and Levitte (1984) report landslide scars on the western slope of the Mount of Olives. In Joel 3:16, he uses a phrase (the Lord will roar from Zion and thunder from Jerusalem) seemingly lifted directly from Amos. The Gospel of the Hebrews is no longer extant. It is mentioned a number of times in ancient literature frequently as a document written in Hebrew and used exclusively by the Ebionites and Nazarenes who were reportedly derived from Jesus’ original followers in Jerusalem and the Galilee respectively. The Ebionites were said to have lived a communal lifestyle, refused to eat meat, obeyed Jewish Law (Halakha), rejected the teachings of the Apostle Paul (which evolved into normative Christianity), believed Jesus was a human being and not a God, and attempted to imitate the life of radical ascetic poverty advocated by Jesus of Nazareth. There are claims that the Gospel of the Hebrews was written by the Apostle Matthew before 40 AD when he left Jerusalem and traveled northeast into the Parthian Empire (according to Pantaeunus and Hippolytus). Jerome, who translated the Tanakh (Old Testament) and the New Testament into Latin for the Catholic Church, produced the most extensive list of quotations from the Gospel of the Hebrews which he claims to have obtained from the Library in Caesarea (Israel) in 398 AD**. At this point in time, this text (which was also viewed as canonical by the Nazarenes) may have been distorted from the original Gospel of the Hebrews and hence is referred to as the Gospel of the Nazarenes for the sake of clarity. In evangelio cuius saepe facimus mentionem superluminare temple lintel infinitae magnitudinis fractum esse atque divisum legimus. 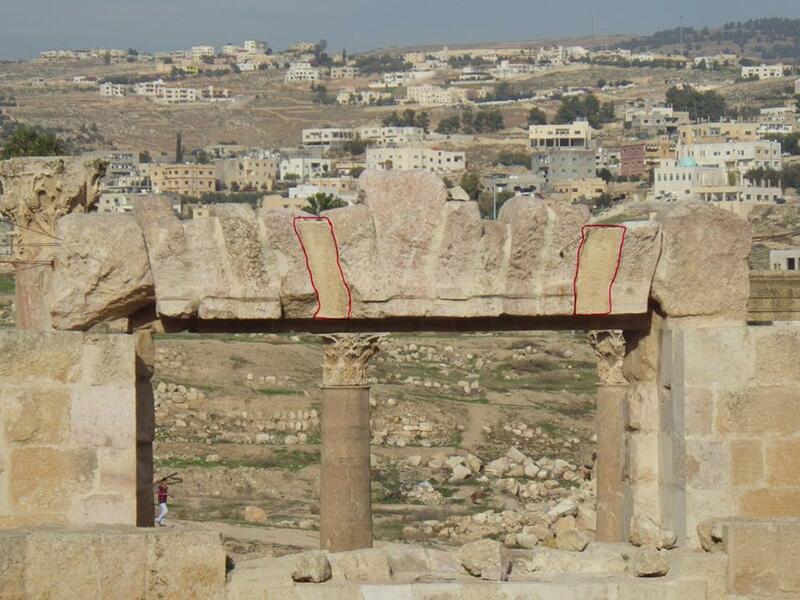 While the canonical synoptic gospels (Matthew, Mark, and Luke) all mention the tearing of the curtain of the Temple in the moments after Jesus death, the description above is more compatible with archeoseismic evidence in the region. 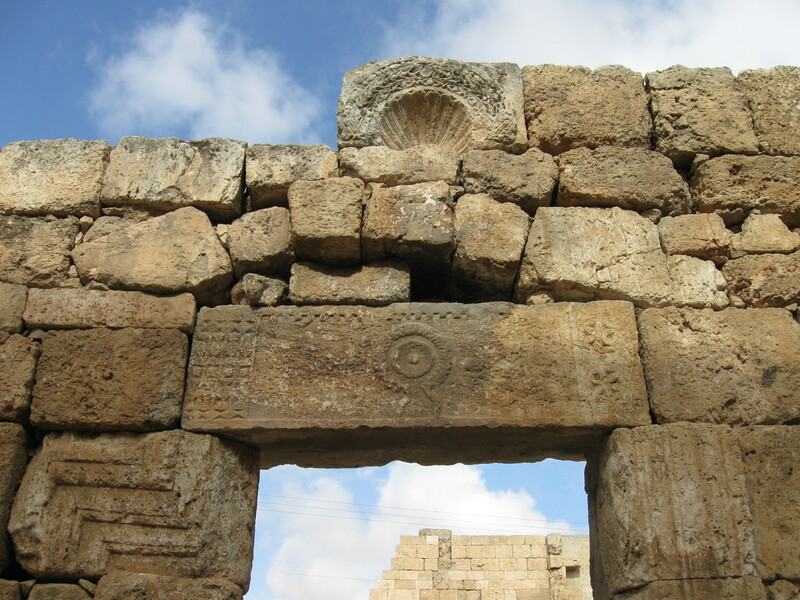 Lintel Stones (example of a Lintel Stone from an old synagogue) above doorways are in fact among the weakest part of a structure and are frequently the first part of a structure to fail (Example from Jerash, Jordan). Hence the description of lintel destruction associated with an earthquake is seismically compatible and could also explain the curtain tearing descriptions in the canonical synoptic gospels since the curtain (parochet) would presumably (possibly?) be attached to the lintel (although none of the ancient descriptions I have seen in Josephus, the Tanakh, the Midrash, and the Talmud mention of how this very think curtain was attached or hung). Although one might be tempted to view the Greek New Testament Gospel of Matthew as a translation from The Gospel of the Hebrews written in Hebrew or possibly Aramaic, this view is not accepted by New Testament scholars. The Gospel of Matthew is noted as being written in what appears to be fluent original Greek and does not bear any marks of being a translation from an earlier text. It is possible however that the author of the Gospel of Matthew was aware of the Gospel of the Hebrews as well as other source documents that have been lost to history. The curtain tearing mentioned in the 3 synoptic canonical gospels could be allegorical fiction symbolizing that the sacrifice of Jesus provided a direct personal link to God thus making the formerly necessary barrier to protect an impure and unclean world from a pure and clean God in the Holy of the Holies of the Second Temple obselete. Such a point would be well understood by readers of these Gospels in the immediate aftermath of the destruction of the Second Temple in 70 AD around which time some or all of the canonical gospels may have been composed. Note to self : Need to cite Eisenmann who appears to be the intellectual founder of the Ebionite’s understanding of Jesus of Nazareth was closer to the Historical (i.e. real and non-legendary) Jesus than what became normative (aka orthodox) Christianity theory. Seismic Events described in The New Testament Gospel of Matthew could have been an effort on the part of the author of Matthew to fit the events surrounding Jesus’ death to coincide with Hebrew Prophetic Literature regarding the “Day of the Lord“. Although this day is often thought of as Judgement Day, it’s meaning was apparently extended to include a day of a collective spiritual transformation. Whether the author of Matthew was inventing, mis-reporting, or accurately reporting seismic history, it seems certain that he was aware of the role of earthquakes (and darkness and moons turning red and stars dissappearing etc. etc.) in Hebrew prophetic literature as his gospel is widely noted to include more passages about prophecy fulfillment than any other and is thought to have been written for a primarily Jewish (rather than a Gentile) audience. Although the Gospel of Matthew was written in Greek, it is is clearly in the tradition of Hebrew literature. Wachs, D. and D. Levitte (1984). “Earthquake risk and slope stability in Jerusalem.” Environmental Geology and Water Sciences 6(3): 183-186.